This Sanskrit name itself has religious overtone and a sort of emotional ring to it for the devout Hindus. This words separation two word Mukti & Nath. Mukti mean Salvation and Nath mean god and Nirvana so It holds great significance for all spiritual people in the south Asian sub continent. This Sanskrit name itself has religious overtone and a sort of emotional ring to it for the devout Hindus. This words separation two word Mukti & Nath. Mukti mean Salvation and Nath mean god and Nirvana so It holds great significance for all spiritual people in the south Asian sub continent. Muktinath (the provider of salvation) has been one such holy site, where thousands of devotees flock for attaining the much sought after moksha( freedom) from the cycle of birth and rebirth. It is an ardent wish or a dream if you may say, of every Hindu to get Mukti-Nirvana from this cycle taking births over and over again. It is belief of the Hindus that this world is "MAYA" (an illusion) and the earliest one gets out of it the better and a visit to Muktinath will help them achieve that goal. Since then it called Muktinath. South Indian people called this place "Muktidham" It means holy pilgrimage place of salvation. Most of South indian People compulsory to visit this place in their life. Similarly Buddhist calls this valley the Chumig Gyatsa which in Tibetan means 'Hundred Waters'. 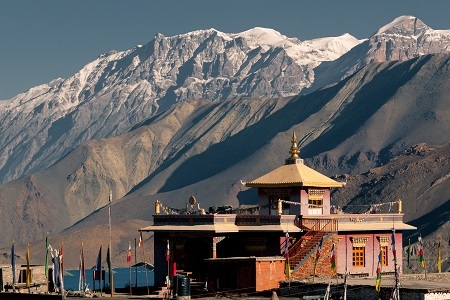 For Tibetan Buddhists Muktinath-Chumig Gyatsa is a very important place of Dakinis, goddesses known as Sky Dancers and one of the 24 Tantric places. They understand the Murti to be a manifestation of Avalokitesvara. The valley has seven historic village: Putak, Jhong, Chhyonkhar, Purang, Jharkot and khinga. Ranipauwa (lit.queen's pilgrim hostel, named after queen Subarna Prabha Devi) is a new settlement founded by people of Purang. The main ethnic group of the valley is Bhotias.